As the world evolves around technology today, there is a high demand for engineering graduates in a fast developing country like Malaysia. A qualification in engineering gives you a head start in career. That's why Open University Malaysia (OUM) is committed to develop and provide programmes which are relevant to the needs of employers. 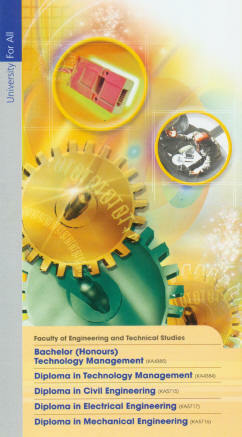 The engineering and technology management programmes prepare you for the exciting future. These programmes are specially created to equip you with various engineering theories and practices which you will find useful in your field of work. Opportunities are abound for OUM engineering graduates. You can easily seek employment in the fields of civil, electrical and mechanical engineering. Your career options may also include manufacturing, production, maintenance, project consultancy, sales and marketing of technological products and services. The Bachelor Degree takes 4 academic years (12 semesters) to complete. The maximum period for completion is 8 academic years (24 semesters) while the Diploma courses takes 4 academic years (12 semesters) to complete, the maximum period for completion is 6 academic years (18 semesters). With credit transfer, students may be able to complete their studies in a shorter period. Fees for the Bachelor Degree course is RM 150* for one credit hour. The fees for the Diploma courses is RM 120* per credit hour (RM 150 for Engineering Diplomas). The total amount that a student needs to pay for a particular semester will depend on the number of credit hours taken during that semester. Application is open throughout the year for all programmes. However. intakes are on a semester basis in January, May and September. 1) Complete the OUM application form (Application form can be obtained from OUM website); on-line application is also available. a- Processing fees of RM25 in bank draft or postal order payable to UNITEM Sdn. Bhd.